Brenda Hinton is a vegan and living food chef instructor. 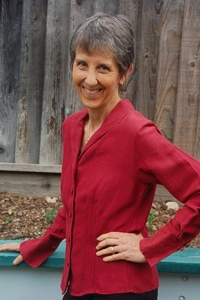 Her interest in healthy food began in the mid 1990s when she left her urban work, and gave herself the gift of time and space to intensify her connection with the natural world. Brenda's study of living food became much more serious when her life was threatened by stage three cancer in 2007. 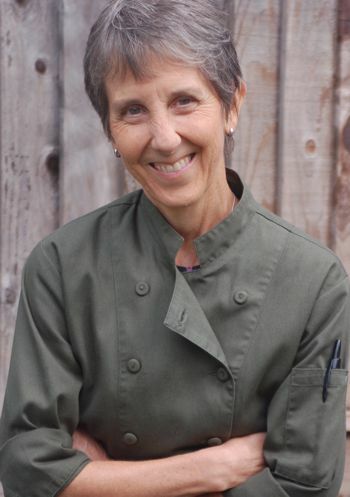 As a cancer survivor, her commitment to raw, unprocessed, and locally produced foods deepens every day. 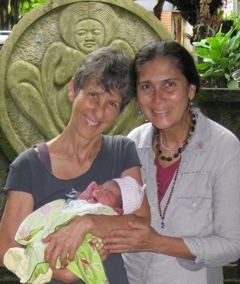 Brenda explains, "When I eat living foods, I feel energy coursing through me. Gluten makes me feel heavy and slow. Fresh, nutritious vegetables from my own garden give me much more of a boost than I ever get from cooked food. "In my work with others, both those with health challenges and those simply seeking more vigor, I find that most of us benefit from a simpler, less processed, additive free diet lovingly prepared with ingredients that are as close to their source as possible." Brenda attained her Chef-Instructor credentials through studies at Cornell's Plant-based Nutrition Program and Living Light Culinary Institute. Brenda's husband, Mike, is her primary test audience. He says, "I'm a choicetarian: I make better choices now." Brenda amplifies, "Mike's eating evolution shows me how we can all improve our health by gradually increasing the authenticity of the food we eat. Mike still enjoys the occasional hamburger, but now he wants to know who raised the beef, and how it was fed . . . then, for his next meal, he's likely to choose a salad. We can all practice stepwise refinement in our eating habits, and we are very lucky, because there have never been more or better choices: farmers markets, farm-to-table restaurants, beyond-organic farming, and a comprehensive awareness that we are what we eat. By gradually identifying the foods that make us feel good, and decreasing those that sap our strength, we can counteract the tolls of stress and aging." Brenda's explorations have, over the years, had her working as a guide and tour director, solar energy instructor, animal communicator, bioresonance therapist (healing at the energetic level), and geobiological consultant (the study of earth disturbances in relation to health) -- all these inquiries share a focus on fundamental, under-utilized technologies that she considers central to a holistic participation in life. Brenda's skill as a communicator and explainer, and her enthusiasm for the discoveries that she has found in these disciplines, make her an inspiring teacher and coach. When working with the animals she began noticing the correlation between diet and disease. With changes in their diets to more raw food components, physical healings became unmistakable. She then added Bioresonance Therapy to her practice and began seeing continued success on a physical level. The animals' owners began asking for therapies themselves and her practice expanded to serve them. Through the years, seeing the success of her animal clients when their diets were adjusted to include more raw food components, she continued refining her own diet to include more plant based options. 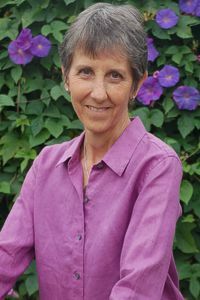 Brenda's study of the connection between diet and disease intensified when she was diagnosed with breast cancer. Today, cancer free, she remains committed to her passion, through personal experience, that we are indeed what we eat and in addition, we are a product of our environment, and both of these things can be changed to affect our healing at the most basic level. As a Raw Food enthusiast and Associate Raw Food Chef and Instructor, Brenda now adds these credentials to her growing list of tools. Her strong desire to get to the bottom of our health stories has strengthened her commitment to assisting clients in changing from the inside out. Brenda Hinton, Brenda's company, focuses on uncommon special purpose tools for living and raw food kitchens. People in the process of transitioning away from the Standard American Diet, working with the diet-disease connection, or exploring living foods find her flagship product the 'More than a Nut Milk Bag' an important multitasker in their kitchens. 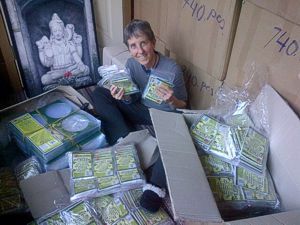 In August, 2012, Brenda published a book, More than a Nut Milk Bag Recipe Collection, that provides instruction and recipes for users of her Nut Milk Bag. Brenda is continually refining her craft, researching, evaluating, and sharing her latest enthusiasms with her clients, customers, friends, and family. Her periodic newsletter (archived here) is her main way of communicating her freshest ideas. She is currently working on a new book about the links between food, personal energy, health, and well-being. 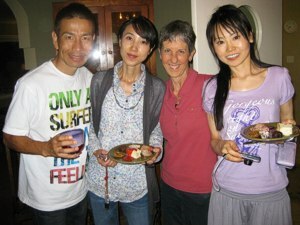 In addition to being a "foodie" Brenda is a recreational runner. 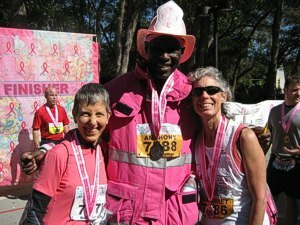 She trains for occasional half-marathons -- "Donna's Run is my all-time favorite run. I'd love to do it again." She lives in a solar-powered home in the middle of an orchard, vineyard, and vegetable garden with her husband and small menagerie. I am always striving to be a clear and open channel for truth -- may truth manifest through me in all I do. May I always be a help to those I meet; may I be a catalyst for positive change. I intend to do my work with open eyes, ears, and a heart full of compassion. Let my work be always for the greatest good for all. May all be loved, and blessed. May we all know peace.